I like how close it was to the beach and also how quiet it was. Have stayed here countless times & always enjoy ourselves. 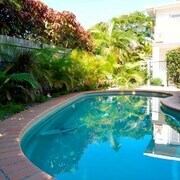 Fantastic location, lovely & quiet & walkable distance to cafes. Which hotels are closest to the Peregian Beach airport? Where to stay near top Peregian Beach attractions? What kind of hotels are in Peregian Beach? Which hotel chains are in Peregian Beach? Travelers give high marks for the beaches in Peregian Beach, which is also known for its spas. Tourists can also enjoy all the city has to offer including its golf courses. 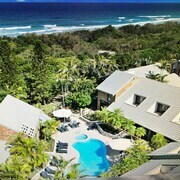 The city's natural setting is picturesque, including the beaches and such places to visit as Coolum Beach and Lake Weyba. Additionally, you might want to add Peregian Golf Course to your agenda. 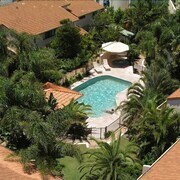 The Retreat Beach Houses - With a stay at this 4.5-star apartment, guests can enjoy access to an outdoor pool and free parking, along with an in-room kitchen. It's a favorite with Expedia travelers for its family-friendly amenities and beach locale. 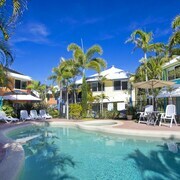 Lake Weyba Cottages Noosa - Our customers like the breakfast and beach locale at this B&B. This 4.5-star bed & breakfast features free WiFi, free parking, and a conference center. 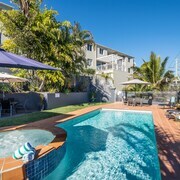 Glen Eden Beach Resort - With a stay at this 3-star apartment, guests can enjoy access to an outdoor pool and free parking, along with an in-room kitchen. Expedia customers like its beach locale and overall value. 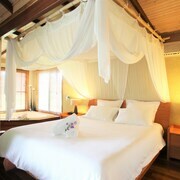 Are there hotels in cities near Peregian Beach? 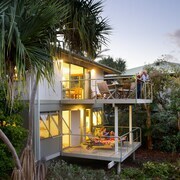 Explore Peregian Beach with Expedia.com.au’s Travel Guides to find the best flights, cars, holiday packages and more!